Not a flopper, a whopper. I saw it Friday night in an absolutely packed house. I saw it again Saturday night, too, just to make sure I wasn't dreaming. The film is opening huge, and displaced The Force Awakens on Friday for the day's top box office take. The Revenant is also making everyone's Oscar short list in multiple categories, including Best Actor, Best Director, Best Cinematography, and Best Picture. But here's a funny anecdote for you, to provide a sense of how broadly people's opinions can vary about art—or this film. After it ended Friday, you could hear a pin drop. And then began one of those raggedy yet strong standing ovations you get at films (as opposed to seemingly synchronized or choreographed ones at plays, led by wanting actors on a stage). As we filed out, people were whispering, raving, seemingly sobered, stirred, moved, or even enchanted. Saturday, I saw it in another city, in another theater, and obviously with another crowd. When it was over, the toad behind us turned to his wife and burped, "I give it a low B." She indifferently sniffed, "Yeah," as if someone had mistakenly handed her a half-eaten M&M rather than some coveted Monster Truck Show ticket. But in the row ahead, a dozen adherents sat quietly, respectfully, studying the credits 'til the very end, then left and buzzed to one another, "He'll definitely get an Oscar for that one." "Everyone's a critic," I thought from my velvet perch. And we each have the right to be, of course. It's the way of the world. As for my two cents, I am of the opinion that Alejandro Iñárritu is a visionary. His frequent partner in crime—cinematographer Emmanuel “Chivo” Lubezki—is fast becoming so ahead of his time that, to my way of thinking, he's practically creating a standalone stylistic genre, the sort pioneered by NBC's ER, which included a lot of "walk and talk" tracking shots that embed the viewer rather voyeuristically into a scene, making one feel that s/he has become part of the dialogue and essential to the action. You may have already appreciated Chivo's work in Birdman, Gravity, Tree of Life, Children of Men, or Ali. It's a little frenetic, a little dizzying, and only sporadically a little much. On the whole, it is flat-out mesmerizing once the ol' inner ear dials-in and you've acclimated to the bounce. I equate it to watching life as if it were filmed by a butterfly. 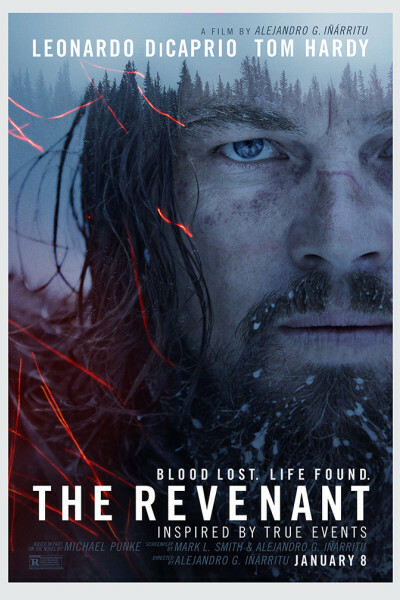 Occurring during six tumultuous weeks in 1823, The Revenant portrays unfortunate scout Hugh Glass's comings and goings before and after a bear mauling. There are Ree indians, French fur trappers, a motley crew of ne'er-do-well Americans, and a rather glaring shortage of antibiotics, lip balm, and loos. The next hot shower-and-shave you take after seeing the film will feel entirely unnecessary and completely frivolous. Tom Hardy, Domhnaall Gleeson, Will Poulter, Lukas Haas [surprise! ], and all the rest perform dutifully, but this is so clearly a DiCaprio vehicle that it matters not one iota who rides in his sidecar. You're not seeing it for them, you're seeing it for him—and to watch him love, lose, and live on. And to ride that thundering horse over the everlovin' cliff while dodging zingy arrows. And he does that, my friend, he does all that and so much more. Somehow, in The Valley of the Shadow of Death, Glass reminds us the price of every single breath, the precariousness and preciousness of life, and shows us—whatever his initial motivation—not only what it is to survive but, eventually, what it is to live again by leaving it all on the field, then in the Creator's hands.